Solving problems comes as second nature to Ampcontrol, one of Australia’s largest and most successful electrical engineering and manufacturing companies. 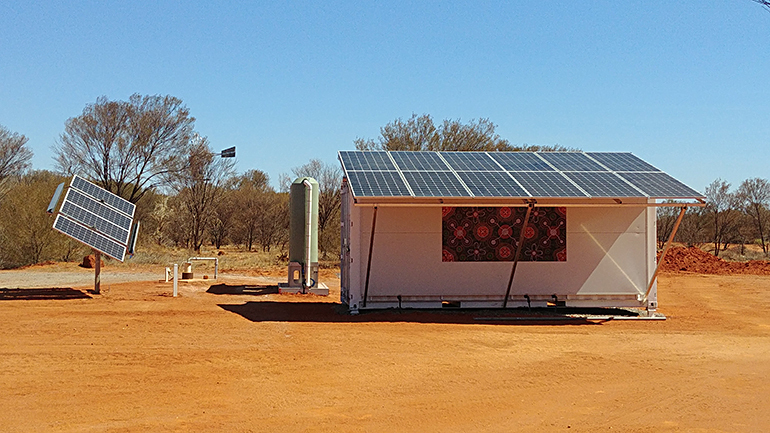 When presented with the challenge of delivering drinkable water to a remote, indigenous community approximately 75kms from Alice Springs in the Northern Territory, the team set about engineering a solution that could be maintained and supported locally. Partnering with Aurecon on the design of the hydrology system, Ampcontrol devised a unique and entirely portable solution that literally transforms undrinkable bore water into pure water. The parties dubbed this Project Gilghi, with Gilghi meaning “water” or “place of water” in the Barkindji indigenous language. “Innovation is very much a part of the culture at Ampcontrol, and we specialise in electrical design and advanced manufacturing. We are grateful for this opportunity provided by the Northern Territory Department of Local Government, Housing and Community Development and Ingkerreke Outstations Resource Services. Our partnership with Aurecon meant we were able to leverage the respective strengths of our two organisations and deliver a truly unique solution” said Ampcontrol’s CEO and Managing Director, Rod Henderson. After months of collaborative engineering between Ampcontrol and Aurecon specialists to devise the reverse osmosis water treatment plant and electrical infrastructure to power the system, what looks like a shipping container with solar panels has meant the people of Gillen Bore have immediate access to clean, contaminant free drinking water. The bore was sunk in 2014, however the community were still getting their drinking water trucked in until the system was installed onsite in late February. Aurecon’s Design Director for Water and Wastewater Treatment Julian Briggs said groundwaters in arid areas commonly consist of high concentrations of salts as well as minerals, often described as ‘hard water’, which can cause problems both for human consumption and for household technologies designed for softer waters. “By partnering with Ampcontrol what we have been able to achieve is something that is fit for purpose and scalable to the environment. We’ve designed a transformative technology that will have an immediate impact on the local community,” Mr Briggs said. The local community created a beautiful artwork titled “honey ant dreaming”, which is a big part of their culture – this was installed on the exterior of the system and provides a great visual connection for the people and their new water source.